The Tractor Model Single Post Hole Digger is an ideal machine to be used for fencing purpose and tree plantations purposes. Simply, it can be put to use for digging holes on ground with the use of the Tractor. One can choose the Auger Size depending upon the desired hole size. The digging is faster and less garbage of soil is generated. Very efficient way of digging as compared to the Manual Digging. The whole process of digging requires less labour intensive as it involves the PTO driven tractor. The machine is suitable for all types of soil. Consists of heavy duty gear box with 2” of output shaft involving shear pin protection. Flighting 14”, 16”, 18”, 20”, 24”. 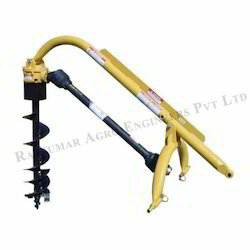 Rajkumar’s Tractor Model Single Post Hole Digger is well suitable to be used worldwide. Rajkumar Agro Engineers Pvt. Ltd. looks forward to cater to your needs. For more details, please drop in an inquiry, with your full name, complete address and contact information. Looking for Tractor Model Single Post Hole Digger ?